The Little Albert Experiment was a study conducted back in 1920 by famed psychologist, “the father of behaviorism”, John B. Watson. It essentially involved conditioning a baby, identified only as “Albert. B” to experience fear at the sight of anything fluffy. Putting aside the egregious methodology problems and questionable ethics exhibited during the experiment, the reported results of the study, and its significance in the history of psychology, have seen the study become one of the most famous and oft cited in the entire field of human psychology. So how did it all start? Watson was greatly intrigued by the work of Russian researcher Ivan Pavlov who inadvertently stumbled upon the idea of conditioning theory while conducting an unrelated study on the digestive system of dogs. For the uninitiated, during his research, Pavlov made the curious observation that his fuzzy research subjects would begin salivate before being presented with food almost as if they knew it was coming. Pavlov eventually realised that the dogs were in fact salivating at the sight of his research assistants walking into the room and that the dogs had come to associate them with food. After several experiments, Pavlov was able to make the dogs salivate at the mere sound of a metronome ticking, a previously neutral stimulus, among many other stimuli, leading him to the conclusion that responses to a random stimulus could be conditioned given the right tools. As for Watson, he was curious about whether humans could be conditioned in the same way (in truth, Pavlov later experimented with orphan children wondering the same thing- see Bonus Facts below); so naturally, rather than conduct experiments that would have no chance of being psychologically damaging in any way to a child, Watson decided to go with terrifying a baby. 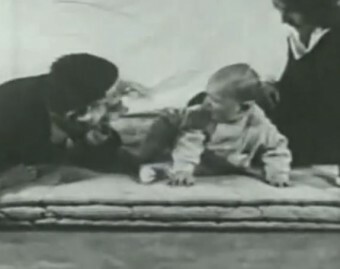 The experiment was conducted on an infant as Watson believed them to be blank slates emotionally speaking and according to the scant amount of information left over from the experiment (Watson burned many of his original notes prior to his death in 1958) little Albert was “chosen” from a hospital located on the grounds of John Hopkins University at the age of 8 months and 26 days. According to the original paper, Albert was chosen due to his remarkably calm temperament with Watson and his graduate student (and mistress) Roslie Raynor describing him as a wholly “stolid and unemotional” infant who very rarely cried. After being selected, Albert was given a series of tests in Watson’s “infant laboratory” to establish his baseline reaction to a number of stimuli. Over the course of a number of experiments, Albert was exposed to a white lab rat, a rabbit, a monkey and for some reason burning newspaper, none of which seemed to phase the awesomely stoic Albert. Ultimately Watson waited until Albert was 11 months and 3 days old before continuing his experiment, during which he once again present Albert with a fluffy white lab rat. As Watson expected, Albert reached out to pet his new fuzzy companion, at which point Watson used a hammer to strike a concealed four foot long, 3/4 inch in diameter steel bar directly behind the baby causing a loud ringing noise, which resulted in Albert crying. Watson repeated this experiment multiple times until eventually just the sight of the rat caused Albert to (seemingly) become frightened and try to crawl away. But making a child terrified of rats isn’t so bad, right? I mean, there’s even small potential that this could be beneficial at some point; nobody wants their child getting bitten by a wild rat, for instance. The problem was that, as Watson had theorised, Albert generalized and became terrified of anything with fur including rabbits, dogs and even men with fluffy white beards. To make matters worse, Watson didn’t bother to desensitize the child when Albert was ultimately released from the hospital. At first there was considerable hesitation upon our part in making the attempt to set up fear reactions experimentally. A certain responsibility attaches to such a procedure. We decided finally to make the attempt, comforting ourselves by the reflection that such attachments would arise anyway as soon as the child left the sheltered environment of the nursery for the rough and tumble of the home. So did Albert grow up with a crippling phobia of fur and beards? This isn’t known, nor is the identity of the child. That said, researchers have come up with two possible names based on what little information we have- Douglas Merrite and William Barger. The case for both Merrite and Barger being Albert are very strong as they were born within a day of one another at the same hospital whence Albert was chosen and both had mothers who were wet-nurses, of which there were only four employed at any one time in the hospital. The name Douglas Merrite was happened upon after an exhaustive 7 year study helmed by Hall P. Beck, his colleague Sharman Levinson and a relative of Merrite named Gary Irons. Sadly, Merrite’s story isn’t a happy one and if he is indeed was Albert, it casts the already controversial experiment in an even darker light. According to Beck’s research, Merrite was the son of a wet-nurse named Arvilla Merrite. Starkly contrasting Watson’s description of Albert as one of “the best-developed youngsters ever brought to the hospital”, Merrite was a very sickly baby who suffered horribly from hydrocephalus (fluid on the brain); a condition which eventually claimed his life at the age of 6. If true, this would mean that Watson deliberately lied in his paper and perhaps more importantly, spent a considerable amount of time tormenting a deathly ill infant. Although Beck’s research was thorough, it wasn’t conclusive. As a result, some researchers choose to believe that little Albert was actually a baby named William Barger. Unlike Merrite, Barger was described as being the picture of health as a child, which falls in line with Watson’s description. Barger’s medical records also indicate that he was a healthy weight for a baby, whilst Merrite was underweight, the latter of which doesn’t at all fit with the known images (and video) of Albert showing a plump, robust infant. Finally, it was discovered that Barger’s middle name was, in fact, Albert and that is what he always went by even into adulthood, which would explain how Watson came up with the name “Albert B”. Barger had a considerably happier life than Merrite, living to the ripe old age of 87 and, according to friends and family, he was a nice man who lived a fulfilling life, though he reportedly had an aversion to dogs which his family enjoyed teasing him about (at least, according to his niece). While Pavlov today is famous for his experiments with dogs, a little known fact seemingly left out of every text book the world over is that the much honoured Pavlov conducted the same experiments on orphan children, including surgically implanting the same type of saliva collectors on some of them, as you see in the picture on the right. Further, his experiments on dogs and humans didn’t stop at positive reinforcement; he also experimented with negative reinforcement, such as flooding the dogs’ kennels to make them think they would drown and shocking them instead of using metronomes or other such humane queues. Watson was forced to resign from his position at Johns Hopkins University, not because of any experiment, but because of an affair he had with one of his graduate students, Rosalie Rayner, who helped him on the Little Albert experiment. After becoming suspicious, Watson’s wife managed to sneak into Rayner’s bedroom and found love letters from her husband to Rayner, some of which were later published in the newspaper. In the resulting very public scandal, Watson was forced to resign, divorced his wife, almost immediately married Rayner (who would die approximately 14 years later of dysentery), then took what ultimately turned out to be an extremely lucrative job in advertising, including one of his very successful Maxwell House coffee ad campaigns being credited with popularising the now ubiquitous “coffee break”. Among his other exploits, Watson also put significant work into the study of the best way to raise children, including writing a popular book on the subject called, Psychological Care of Infant and Child. It advocated, among other things, making sure mothers and fathers didn’t bestow much affection or tenderness on their children (with particular emphasis on mothers, including a whole chapter titled Too Much Motherly Love). As for Watson’s own two children raised with this method, both attempted suicide. One succeeded. The other claimed he and his brother’s struggles with depression, among other emotional issues, were the result of his father’s behaviorism parenting principles. Little Albert – who was he? Positive reinforcement doesn’t mean to do something nice; it simply means to add a stimulus. Negative reinforcement doesn’t equate with cruelty; it means to remove a stimulus. Flooding and shocking introduce new stimuli and would therefore be positive reinforcement. – The use of shock to get an animal to stop doing something–such as when it barks, it then gets a shock and subsequently stops barking– would be an instance of positive punishment, not positive reinforcement. The consequence consists of adding something (which is what the ‘positive” refers to) and the behavior become less frequent (which is an instance of punishment). – As for Pavlov “flooding the dogs’ kennels to make them think they would drown,” what actually happened was that there was a major flood in Leningrad and the dogs came near to drowning before they could be rescued. Pavlov later noted that the traumatic experience had certain effects on the previous conditioning they had gone through. – As for Little Albert being “terrified” by the conditioning procedure, Watson in fact had trouble maintaining Albert’s fear of animals and had to keep redoing the conditioning to get a response. He also had to keep pulling Albert’s thumb out of his mouth; when he was sucking his thumb, he wasn’t afraid of anything. GREAT POST KARL. TNX. PLS PUBLISH SUCH A DETAILED POST ON Dr. Harry Harlow’S MONKEY EXPERIMENT (GAWD, IT GIVES ME NIGHTMARES AND BOUTS AND BOUTS OF DEPRESSION) ALSO, AND IF POSSIBLE, A EPUB LINK OF A FAMOS DETAILED BOOK ON THE SAME. Regarding Pavlov, he actually supervised the person who experimented on orphans, his pupil Nikolai Krasnogorsky. He did not conduct the research himself. Krasnogorsky also conditioned babies to respond to bell ringing, though humans are a bit more resistant to it than dogs. While Pavlov is absolutely problematic, he didn’t experiment on children as far as I’m aware. Cognition and Neuropsychology: International Perspectives on Psychological Science edited by Frensch has a very detailed article about it. affection among any of them.